This movie shows me making baguettes with a 80% hydration dough without mixing and only using autolyse and the stretch and folds technique to strengthen the dough. The baguettes are baked in a Rofco hearth bread oven. The oven floor unfortunately caters for shorter baguettes (45cm /17.7 inches), but that will be the case with other home bakers’ ovens too I guess. Over the next months I hope to improve my baguette shaping techniques. I developed the shaping technique you see in the movie myself to best handle the very wet dough that comes with 80% hydration. There is a little time lapse video shot at the ‘end’ of the movie were you see the oven spring of the baguette and the browning of the baguette in high speed. Check out my recipe for the 80% hydration dough French baguette. Keep track of my baguette baking adventures through my home baker’s log. Thank you for great help and recipe calculator on the site. I’ve followed your recipe exactly as stated. No extra flour and I use King Arthur bread flour. My bread comes out very tasty however the crumb is not as pictured here. I have very few air pockets. The only thing I know for sure is my oven looses 80 degrees temp no matter how fast I can get the dough and water in. From this point it struggles to get back up to temp before the bread is done. 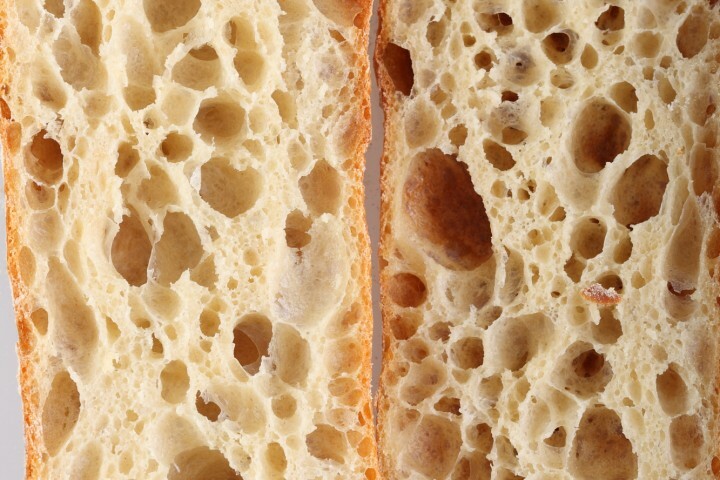 I’m not sure if this is 100 percent of the reason for the difference in the crumb. Any help would be much appreciated. We understand. Try starting at a higher temperature to compensate and see how that goes. The steam also cannot do its work properly this way probably. Next to this the shaping and especially the proofing can play a part in the structure. So make sure you proof well and your dough has the right temperature while proofing. Hope this will help you to improve. I liked the video very much, but can you tell me about how long or how many stretch and fols there are for each 45 min scession? You can find a handy time table with S&F overview at the bottom of the recipe. omg, you are a life saver. I could not figure out for the life of me how to fold really sticky dough….your video totally made me “get it”……Thank you so very much. Glad we could be of help this way. Excellent! I am trying yo make light and airy pizza dough gór neapolitan pizza. Fo You have recepie for that or some tips? We have heard the caputo should be good for pizza. It should be no problem to get good dough with that but we do not know what your process is for developing the dough. You could also think about a 24 hour dough development with retarding in the fridge. please tell me about that wonderful oven you baked the baguettes in. Very intriguing looking oven indeed. I love this recipe! I love these baguettes! Enjoy making them and enjoy eating them! 🙂 Recently bought the linen cloth from you! Happy days:) Practicing making baguettes and give them away! People love them:) Thank you a lot! Thanks again Lidia. Baking is a joy and sharing sometimes brings even more pleasure, knowing people appreciate and love what you make. Very rewarding! Perfect! So nice to learn from your website! Thank you for letting us know Julie! Thanks a lot! I really like this website, and particularly this video has provided me with the courage to work with wetter doughs. I have not yet made these baguettes, but it helped me a lot making Ciabattas, where 5/6 of the flour is used for a dry biga which the next day is blown up by adding water salt and the rest of the flour, and barley malt I got donated by Brouwerij het IJ. It allso complicates the choice of the working space for my citchen after renovation, I like steel, but the steel option is not just flat steel, it has a profile which is actually great for making italian pasta like tagliatelle etc but not the most practical for sticky dough, but maybe i will find a solution like something flat I will place upon my working space. I enjoyed the video, and made the baguette using pizza granite stone. The first batch didn’t turned well, but the second one great. Thank you for the instructions. Next week I will try using white spelt flour, and also other varieties. Thank you Raj, that is great, trying out the recipe, making it your own and enjoying the process! hi, im a beginner in bread making and im wondering what kind of stone can i place in my oven to get that beautiful crust from baguette without having to spend a lot in custom design my oven? You should always look for a stone that has good heat retention and dissipation and is suited for use in an oven. Our stone oven has three layers of ‘chamotte’ stone and lots of pizza stones are made of similar material. So do make sure the stone is suited to use in an oven and has the right properties for the best results. I use terracotta tiles originally meant for a floor, and for pizza, where I want a lot of heat, I use ordinary bricks I found in my garden, my oven is a very old gas oven. Since I made baguette today, I will make this recipe on Thursday. You make it look so easy. I feel beaten up after I made mine. Great video, fun to watch. Zero 7 and Flight of the Conchords! Helpful video and wonderful music I enjoyed very much. Thanks! Thanks again Ako. Happy music happy baking! Great web site. How much raw flour is needed per baguette. Thanks so much for the video, it was both entertaining and very informative. But I’m wondering if you can help me with room temperature and room hydration level? Our kitchen gets really warm up to 31-32 degrees in the afternoon. I am trying to get the room to be as low as 26-27 degrees but still tackling it. We do have sheeting room which is better, but it is high traffic so the room’s temperature is quite unstable. HELP?! Our advice would be to lower the amount of yeast to compensate for the room temperature. Just give it a few trial runs and see what works best. Try to bake when the temp is not at a peak of course. Make use of a fridge of possible and if you want to slow down the process. Nice baguettes and great oven, what kind of an oven is it and where did you get it? I love to cook but don’t bake. I’ve always been frustrated with not being able to get a really good baguette outside of France, and have been on a quest to create one at home. After studying and trying every method I could find, I began to get a good concept as to what was necessary, but never had the quality result I was looking for. Thank you for showing me the answer to a truly flavorful, chewy, airy, authentic baguette that would please even the most picky Frenchman! The starter and high hydration are obviously imperative to the wonderful results I achieve using your method. However I believe your not overworking the dough, allowing the yeasts and flour to remain distributed unevenly, and simply allowing it to do what it wants to do naturally, is the true secret you have brought my efforts. Thank you for sharing your knowledge. I now bake, quite simply, the best baguette money can’t buy! Thank you so much for your wonderful comment. Excellent description of the recipe and results and so glad you found our recipe of so much help to you.